After my last post I had to don my white coat a try to franken up a magnetic holographic polish. I chose to do a blue franken because I have most holographic polishes in blue, and if it didn't work then I had only used up a common colour in my stash. So here it is. I only mixed up a tiny bit (about 3ml all up), in case it didn't work, but the ratios were, 1/2 magnetic polish, 1/4 OPI DS Glamour, 1/4 Nfu Oh 65. The mixed colour was gorgeous. A holoie cornflour blue. Then the big test, did it still work with the magnets? Yes, it did. Not as pronounced as it is on its own, but it was definitely magnetic. 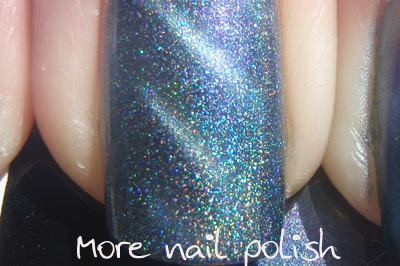 Here it is up close to show the holo a bit better. Here is a comparison swatch of just the magnetic polish next to my franken. If I hadn't added the Nfu Oh 65, and just used DS Glamour, it would have been darker, but I really wanted a bit of linear holo in the mix too. Green magnetic with L8R G8R or Artform green holo. 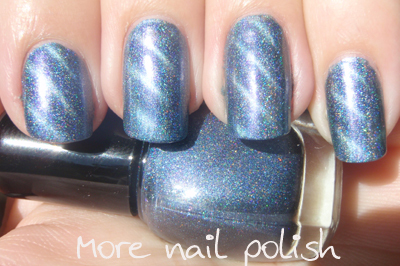 So its nothing like what I would like a 'real' magnetic holo to do, but its still beautiful. Very cool! 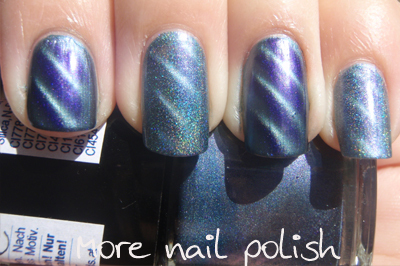 I can't wait to get my hands on some magnetic polish once I get over the cost of shipping. OMG How a cool idea to franken a magnetic, hihi! OMg it's the best franken I've ever seen! Awesome!! What sort of magnetic thingie do you use? Yes, very technical I know, thingie!